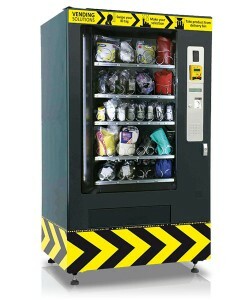 Personal Protection Equipment such as safety glasses, gloves, helmets, and many other items are stored safely inside the vending machine. Smart Card/Key Ring is used to operate and dispense items from the PPE / Industrial vending machine. The card will allow the tracking of items to their users to ensure that items are not stolen/misplaced. Users can easily access items and employees can easily control stock of items with our efficient vending machine system that allows users to dispense a safety item in the work place; safely and efficiently. The system contains many features discussed in our FAQ page.